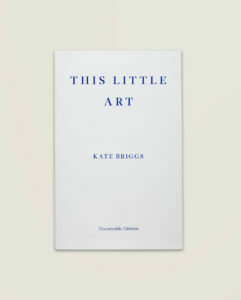 The following is an excerpt from This Little Art, Kate Briggs, Fitzcarraldo Editions, London, 2017. Copyright © Kate Briggs, 2017. Reproduced by permission of Fitzcarraldo Editions. The book is available now in the U.K. and will be available from all good bookstores in the U.S. on April 4, 2018. It is easy not to think about translation. This has to do, of course, with the way translations typically get presented to readers: the name of the original author in full caps and bold; the translator’s name smaller or left off the cover altogether; reviewers failing to register the fact of reading in and the creative labour of translation. But perhaps it also has to do with the way we tend to talk about—and so also experience?—prose translations. That is, prose translations, as provisionally distinct from all the other ways an existing work of art can be reproduced, remediated or re-versioned. From all the many other practices of redoing, rewriting and remaking—of working with extant material—with which the writing of translations in the so-called ‘standard’ sense is always proximate and talking to, sharing gestures and problematics, but with which it is not, I don’t think, wholly interchangeable. The point is this: unlike those other re-mediations, which might require us to acknowledge the difference of their new materials as well as the intervention, the new gesture, of their reproducer, translations seem to give us the permission to say, quite unworriedly: that book? Yeah, I’ve read it. They give us the permission, or we take it. I’ve read Mann’s novels. I’ve read Buddenbrooks and The Magic Mountain, but not Doctor Faustus, or the Joseph books. I’ve read most of Flaubert. I’ve read Ferrante. And I really like her work a lot. I’ve read Barthes. It’s true that I might sometimes qualify this. I might say (or hear other people say): actually, no. You haven’t. You haven’t really read Barthes, for example, until you’ve read his work in French. But more often than not the possibility of reading in French is offered as a kind of surplus value. As in: there is reading. Yes, agreed. Let’s hold to that: there is something like the baseline of reading that is made possible by translation. And then, added to that, there is the additional value of reading in the original. Does the first assertion, the first reading experience, always have the other somewhere in mind? This is the question that Gérard Genette asks, briefly, in a book called The Work of Art, translated by G. M. Goshgarian. Or, to put the question another way: imagine I were to tell you that The Magic Mountain is in the living room. Imagine. The reason why you’re not a bit bewildered by this is because we both know—we both seem to already know—that what I really mean to say (what the work of metonymy is enabling me to say) is the novel is in the living room: my copy, our copy or someone else’s copy of the novel is in the living room. Does something of the same order happen when talking about the books I’ve read? When I tell you that I have read The Magic Mountain is this a quick small-part-for-the-whole way for me to tell you that I’ve read The Magic Mountain in English translation? The title here standing in for the translation which, in its own complicated way, is standing in for the original—each slightly smaller, reduced part (the title, the translation) pointing to some further, just out of reach and more expansive aesthetic experience (the real one this time, the authentic one)? Talking with you about the books I’ve read, and affirming that I have read them, is this what I mean? Possibly. Or, no. That is, I don’t think so. Unlike me, you may have read Mann’s novel in the German, and I’m very interested to know what that’s like. I’m also very inclined to agree that there’s great value in reading in the original. Perhaps something like the value we recognize and invest in literature. The right words in the right order, as Virginia Woolf puts it so simply in her talk on craftsmanship, delivered over the radio in 1937. These necessary words, in this necessary order. There is literature, arguably, or what we call the literary, when this matters: when we feel like something would be wrong should ever these words or their ordering be changed (if Clarissa Dalloway were to buy gloves and not the flowers herself, for example, as she does in an early draft of the novel). In this sense, literary translation, as a labour of changing words, and changing the orders of words, is always and from the outset wrong: its wrongness is a way of indirectly stressing and restressing the rightness of the original words in their right and original order. Translation operates, then, as a kind of vital test: an ever-renewable demonstration of the literary value of the novel in German. Which is one way of saying that literature, that quality we call the literary, simply cannot do without translation as a means of repeatedly reaffirming it (and when the words of a translation matter in turn, when we feel, in a translation, that it must indeed be these necessary words in this necessary order, the translation has become literature too). The theorist and critic Derek Attridge has written at length about the complex ways our sense of the identity of a work of literature requires, on the one hand, repetition (the repetition of what he calls ‘these specific words in this specific arrangement’ across all material supports: whether the book is read online or on paper or out loud, whether it is printed in this font or that, we are still able to identify it as the same work) and, on the other, an openness to just how non-identical the different manifestations of (and the forms of my engagement with) apparently the same work can be. How, in fact, the font does matter, or it can—likewise the timing and circumstances of my reading, the books I am reading the book with, the people I am talking to about it, who might make me think differently; the difference between reading a book for the first time and for the third. ‘Literary identity,’ he writes, ‘involves both repetition of what is recognized as ‘the same’ and openness to new contexts and hence to change’. In other words, to translation. Which might go some way towards explaining why, even with my keen interest in the original, I still believe—I still feel reluctant to qualify my basic conviction—that when it comes to this novel I, too, have read it. A belief that would appear to get stronger, and even more solid in its foundation, the further away from the original language I feel. Perhaps you’ll hear me say that there are works in French I haven’t truly? or fully? or properly? read because I have only? read them in translation, but that’s surely premised on the chance, the plausibility, of one day reading the originals. Mann on the other hand? Tolstoy? Ferrante? Kang? All those books? Yes, I’ve read them. Or, let me maintain that I have read them. Let me believe that what I have read in English partakes, in all its difference, of what you have read in German, in Russian, in Italian, in Korean. This, after all, has been the form of my aesthetic experience, my own expansive and authentic aesthetic experience. I notice that the more remote the languages seem from my own capacity to learn them, the more assertive I feel. Why is this? I am more willing to register and be troubled by the closer, familiar differences than the more distant ones, I realize, and perhaps this is com-plicatedly true of all of us: when we are presented with a version of something that we know we can’t know, or not without some great, unlikely effort on our part, we are more prepared to accept how it comes, and to grow attached to the only form in which we are able to receive it. An English-speaking friend tells me about reading Calvino, a writer whom he loves, Cosmicomics in particular, and how often he goes back to read the stories that make up that book, and how badly he wants to believe – and, in fact, the degree to which he does believe, despite the translator’s name on the frontispiece – that it was Italo Calvino who handled the words that he is now reading, who wrote them for him. A naïve misconception (or an active self-deception?) on many levels, you might say: this Romantic attachment to monographic, single-handed authorship, this fantasy of unmediated address, and with it—underlying it and enabling it—my friend’s serene failure to notice, let alone to name the translator. One that he could easily think his way out of, if he wanted to (I look it up for him: Cosmicomics was translated by William Weaver in 1968). But worth taking seriously. A common reading experience enabled by translation that I think it’s very important to take seriously. If only because, well, there he is, my reading friend: sitting on his own in a chair with a book. Reading, alone and for the moment uninterruptedly, for some hours at a time. There he is, and this is what he’s thinking, and this is how he feels.